Twomey is in Abbeyleix today. Vera Twomey getting in to Littleton yesterday. 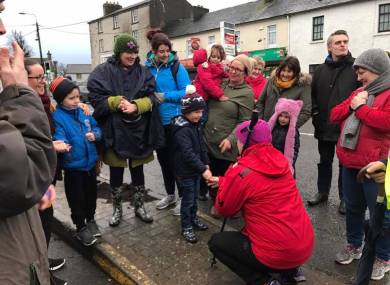 VERA TWOMEY HAS reached Abbeyleix on her walk from Cork to the Dáil. Twomey is campaigning for medicinal cannabis to be made legal in order to help her daughter Ava. She began the 260km walk from her home to the Dáil as a protest against decisions to restrict her Ava, who has rare form of epilepsy called Dravet’s syndrome, from accessing cannabis based medication. Speaking to TheJournal.ie this afternoon as she arrived into Abbeyleix, County Laois, she said she was holding up well. However, despite walking all week, Vera has yet to receive an official response from Health Minister Simon Harris. “There’s still no official response. What I understand is that the health committee review will be next Tuesday, which is being brought forward. But that meeting will have to deliver a report then that will have to be submitted to the Minister. “They can no longer hide behind their excuses or reports or reviews. Twomey has been in a number of meetings with Health Minister Simon Harris and has tried to get the Minister to allow Ava access cannabis-based medicine on compassionate grounds. Ava, who would have suffered dozens of seizures on a daily basis, has had access to CBD oil costing around €300 a month. CBD is a cannabinoid and is legal in Ireland because it does not contain any THC, the psychoactive part of the cannabis plant. Vera is campaigning for access to the full range of cannabis-based medicines. Last week, Twomey released a harrowing video of Ava suffering a seizure to TV3. “Simon Harris has the authority to put this legislation into place. The people of this country want this legislation now. They know there is a little girl whose life can be changed. Email “'We're not leaving Dublin until Ava gets what she needs' - Vera Twomey continues her walk to the Dáil”. Feedback on “'We're not leaving Dublin until Ava gets what she needs' - Vera Twomey continues her walk to the Dáil”.